I love visiting Gulfstream Park in Hallandale Beach. My grandpa sometimes takes my brother and me for an afternoon of horse races. 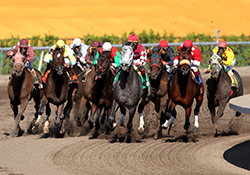 It is a ton of fun to bet on the horses (but you need an adult in order to bet money). The anticipation of seeing if your horse actually wins is very intense. When the horses start racing, you could hear the loud BOOM, BOOM, BOOM of their mighty legs as they gallop around the dirt track. The jockeys wear brightly colored shirts so it&apos;s easy to tell which horse you are rooting for. If you do win a race, I assure you, you will be jumping up and down and screaming your horse&apos;s name. If you lose, that will not stop you from having an awesome experience with your friends or family. Gulfstream Park is a nice place to just enjoy yourself and the people surrounding you. -Written by Lauren, age 13.